CRES Land Trust will host a Grand Opening of its 96-acre James P. Covell Nature Preserve, the local nonprofit’s first public preserve in DeKalb County, 4 p.m. to 6 p.m., Friday, November 4. The preserve is located at approximately 2727 County Road 52, just south of Auburn and east of County Road 427. The James P. Covell Nature Preserve protects 2,700 feet of the west bank of Cedar Creek. 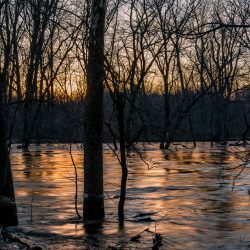 Six miles downstream from the preserve, a 14-mile segment of Cedar Creek is one of only three streams designated under the 1973 Indiana Natural, Scenic and Recreational Rivers Act. 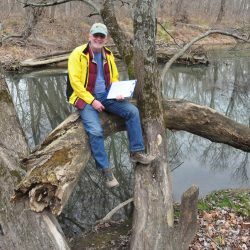 “Protecting this land helps DeKalb County achieve its County Comprehensive Plan goal of improving the water quality of Cedar Creek,” said Kissel. “The creek has been a priority for ACRES for over 50 years.” To date, ACRES and its partners in preservation, with thanks to participating land and major donors, protect nearly 1,400 acres of the Cedar Creek Corridor from Auburn to Leo. ACRES owns 12 properties in the corridor, totaling over 700 acres of permanently protected land. ACRES’ newest open preserve safeguards 40 acres currently in agriculture production, 33 acres of emerging upland forest and 23 acres of mature forested floodplain. Several trees in the preserve are estimated to be more than 150 years old. ACRES will eventually reforest a portion of the farmland, planting a variety of native hardwoods and restore part of it to wetland with a mix of tall grasses. An adjacent 10 acre parcel surrounding a farmhouse and outbuildings, previously the Glen T. Rieke family homestead, is not part of the nature preserve. Jim Covell first contacted ACRES in June 1999 about options for protecting his property. Over the next 12 years, Jim and ACRES developed a working relationship in support of his preservation goals. In 2011, Jim died before fulfilling his vision. Following his death, Jim’s brother, Dr. Jack Covell of Auburn, was resolute in making Jim’s dream a reality. “My brother Jim had a vision for this land. He was an environmentalist and wanted to see the land preserved for the animals that live there, and for people to enjoy it in its natural state,” said Dr. Covell. Preserve wildlife includes several dozen wild turkeys. Otter and mink are known inhabitants of Cedar Creek. In August, the Community Foundation of DeKalb County celebrated its 20th anniversary, awarding ACRES a $20,000 grant toward the new nature preserve. Because of this property’s statewide significance, the Bicentennial Nature Trust and Indiana Heritage Trust provided a portion of the funding needed to acquire this land. Dr. Jack and Joyce Covell, the Lupke Family Foundation, and many individual donors have also supported the project. NIPSCO is funding part of the habitat restoration. ACRES needs $24,000 in funding to complete the project. Following the Grand Opening event, the half-mile trail will be open from dawn to dusk, daily at no charge, thanks to ACRES members. ACRES anticipates heavy trail use of the new preserve. James P. Covell Nature Preserve, located at approximately 2727 County Road 52, Auburn, Indiana 46706, just east of County Road 427. Celebrate the opening of DeKalb County’s first ACRES preserve with good company, cake and a hike! Claxton Woods, a 93-acre tree farm north of Spencerville, donated by Bill Claxton. ACRES opened Claxton Woods for a member hike with the Claxton family in the spring. The property is closed to the public. Heinzerling Family Five Points Nature Preserve, a 116 acre preserve south of Garrett, purchased at a discount from five Heinzerling family siblings. 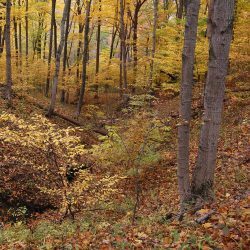 ACRES and the Heinzerling family will host a member hike on the Garrett-area preserve in February 2017 prior to opening the preserve to the public. An 18.5-acre protected land property donated by Karl Sliger located near St. Joe. The property is closed to the public. Together with its members, ACRES preserves 6,050 acres of land in northeast Indiana, northwest Ohio and southern Michigan for future generations. You can explore more than 70 miles of trails for hiking, photography, birding, wellness, family and school visits, and adventure. Connect with ACRES Land Trust at 260-637-2273, acreslandtrust.org or on Facebook at www.facebook.com/ACRES.LT.